This June Burke Williams Day Spa invites you to spoil the ones you love with the gift of a spa treatment. For each generous spa gift purchased, you will receive a gift for yourself in return. Guests that spend $150 on a gift card at Burke Williams Day Spa will receive a complimentary $25 gift card. For each $250 gift card purchase you will receive a gift card for $50. 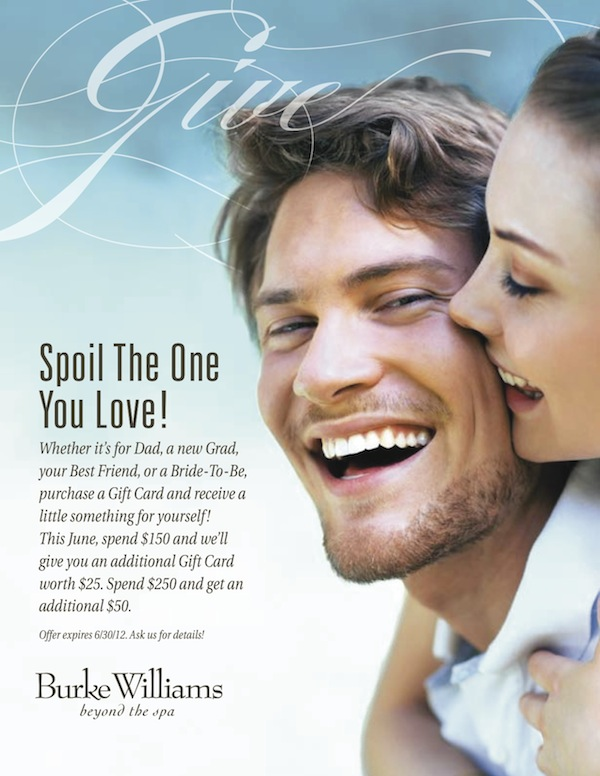 Whether it’s a gift for your Dad, husband, new grad, best friend or bride-to-be, purchase a gift card in June and receive a little something special for yourself at Burke Williams Day Spa. This special offer expires June 30, 2012. Connect with a Burke Williams Day Spa near you to purchase your next gifts for the ones you love.